Here is a couple of photos that inspire me to head to IKEA, Home Goods, Target.... wherever they sell fabulous, affordable home interior items... in order to create these inviting living rooms. Notice the hues in these photos. 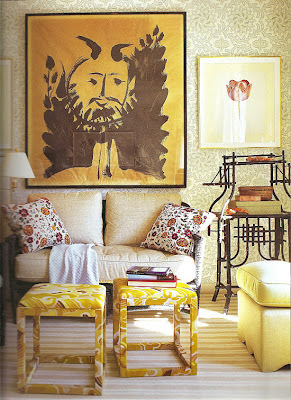 The pops of color in each of these rooms keeps the palette engaging and visually stimulating. *What a spectacular living room! The large windows open to the porch.